snowdeal.org > ex machina: the eric update - day 1010: odin's first pair of glasses! the eric update - day 1010: odin's first pair of glasses! 934 days after first learning that odin was affected by a condition known as retinopathy of prematurity ( the curse of the nicu strikes! ), 930 days after his emergency eye surgery and 511 days after we first learned that his eyesight could be significantly diminshed as a result of the rop, odin put on his very own glasses for the very first time! as many of you know he's been going to follow-up eye exams about every six months to track his eyesight and despite some indications that his eyesight may have been improving, it never was really clear if the variation in exam results was due to improving eye sight per se or, alternatively, due to the fact that it's difficult to get an accurate exam from an uncooperative toddler. lately he's been telling us more frequently when he can't see things that we point out to him and perhaps not coincidentally ( he very much understands that he can't see things that we can see and knows that glasses will help him see better and in order to get glasses he needs to help the doctor ) a few weeks ago he had his best exam yet. he was patient and still and the doctor was able to get a very thorough assessment of his vision which he deemed to be -6.0 (20/420) in his right eye and -6.75 (20/470) in his left. to put that in perspective, what someone could see at about 450 feet away, he could only see standing 20 feet away. it's also worth noting that 20/200 or worse is colloquially known as the definition of legal blindness ( although, technically, one is only legally blind at 20/200 if the visual acuity can't be corrected ). that you'd never know his eyesight was so diminished is a remarkable testament to just how good at compensating for "deficits" growing brains can be. 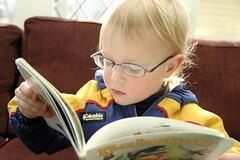 some eye doctors prefer to "stage" the prescription strength of the glasses so that the toddler can gradually adjust to clearly seeing the world, but after consulting with other pediatric opthamologists around the region, our doctor decided it was best to start off with full strength lenses and today they finally arrived. if you've ever worn glasses, you can imagine how different the world looked to odin today! he spent time walking around slowly raising and lowering his feet as he got comfortable learning to get around and immediately figured out that it was a lot easier to read some of his favorite books. Holland's vision is about -4.0 in her right eye, and -7.0 in her left. She took to wearing her glasses very quickly and easily. Now, after wearing them for about 3 months, she asks for them first thing in the morning, and has occasionally cried for them in the bath! We did have one incident of a broken temple bar, and had to replace the frames, but that's par for the course with a 2 1/2 year old! FYI, for me, the pic showing on your page was a duplicate of the bird feeder pic. I clicked on it and was able to see Odin in his glasses. Odin looks deep in thought in his new glasses. Quite the thinking man. Elias is still in the "we're waiting on glasses but they are coming next visit" phase of opthamology at the moment hanging around a -3.0 range in both eyes from the lovely ROP residuals. I'm glad to hear that he is seeing the world in a whole new light with these shiny glasses of his. Hope he continues to wear them as he looks so cute in them!